1. Is it entertaining and/or intriguing? 2. Is it friendly to new readers? 3. Does it make readers want to buy future issues of the comic or item, follow the characters featured therein, or buy other items from the publisher? From Image Comics, Artifacts Issue Zero cover-promises that "the biggest event in the history of the Top Cow Universe begins here!" 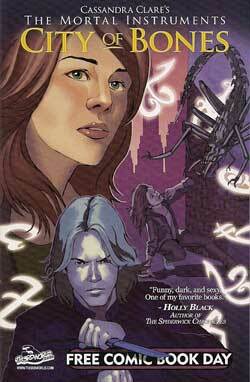 The imprint of Image founder Mark Silvestri, Top Cow is notable for Witchblade, The Darkness and other connected titles. In this issue, a captive Aphrodite IV is told of thirteen artifacts that guide the universe and, if brought together, can end it. Though the story is as talky as you might expect with its 13 pages of full-page shots of the artifacts or those who wield them, writer Ron Marz delivers a story that is both intriguing and very friendly to new readers. With excellent art by Stjepan Sejic, the issue is a convincing sales pitch for the 13-issue Artifacts, which will launch in July. Also included is a four-page vignette from Magdalena which nicely sums up that character's background. I'd rate this as a very successful FCBD offering. Atomic Robo/Neozoic/Box 13 [Red 5] presents complete short stories showcasing each of these three comics. The publisher wisely used the inside front cover to give a couple lines of intro to each feature. "These are the least extinct birds I've ever met." "Neozoic" isn't nearly as engaging. There's some jungle city we never see, said city's defenders, and said city's enemies in a standard action vignette. With so many choices available to comics readers these days, I doubt I'd give it a second look. The "Box 13" segment by writer David Gallaher and artist Steve Ellis is intriguing, but, as the opening pages of a graphic novel, not very satisfying on its own. I'm on the fence as to whether or not I'll check out the graphic novel, though I am leaning towards doing just that. 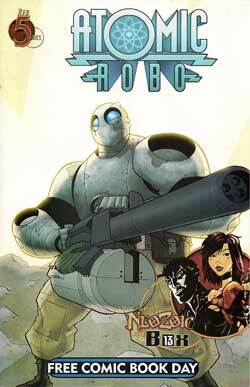 I'd say "yes" to Atomic Robo, "no" to Neozoic, and "maybe" to Box 13. That's a decent showing for a FCBD issue. 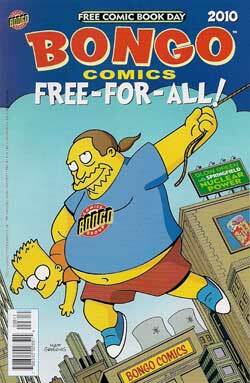 The Bongo Comics Free-For-All is almost a perfect FCBD issue. Chuck Dixon's "Clown Therapy," in which Krusty the Clown must give up show business, would make an excellent episode of the Simpsons TV show. The same for Tony DiGerolamo's "Homer Beats the Heat." The two-page "Maggie's Crib" by Sergio Aragones is funny. About the only story in this issue that wouldn't be instantly attractive to a non-comics-reading Simpsons fans is "The League of Extraordinary Barts" by Ian Boothby. I enjoyed this super-hero parody just fine, but it might be a little out there for a reader unversed in super-hero situations. It's a minor quibble. If I were not already a huge fan of the various Bongo comic books, I'd be heading back to the store to buy as many of them as I could afford. City of Bones/The Stuff of Legend is a flip book from Th3rdworld Studios. "Bones" seems to be adaptation of something by Cassandra Clare - a novel, perhaps? - and is a too-familiar-to-be-interesting tale of demons among us, mysterious protectors, and a teenage girl who is more than she seems. I like the art by Nicole Virella, but I'd pass on buying this four-issue series. 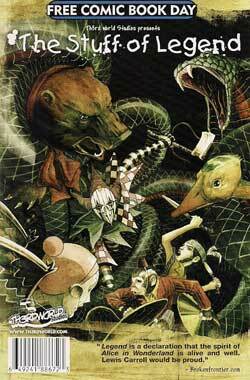 "Legend" has sentient toys trying to rescue their young owner from the evil Boogeyman. It's a workable premise, but the segment included here didn't excite me, though, again, I liked the Charles Paul Wilson III art. In between the two story fragments are three pages of tepid webcomics. I'd pass on these two series. For more than two decades, co-editors Cliff Biggers and Ward Batty have published Comic Shop News, a spiffy promotional newspaper. For this special FCBD issue, they offered lists of and comments on what they considered the best in comics. It's a decent guide, but sadly limited. The editors are way too enamored of DC super-hero comic books; they show but one Marvel publication, the Amazing Spider-Man Omnibus. They are obviously star-struck by Hollywood writers and novelists, making no distinction between those who do good comics work and those who don't. Their selection of manga struck me as dated and barely scratched the surface of the quality and variety available in that category. Alternative comics creators and cartoonists from outside the direct mark industry get shorted as well. Given an opportunity to help expand the market by showcasing some of the amazing new work available in comics stores and bookstores, this issue of CSN failed to take advantage of that opportunity. Very disappointing. 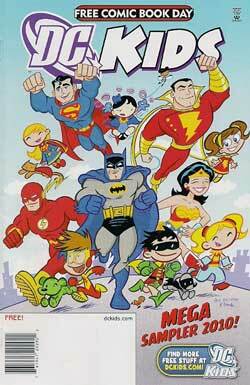 The DC Kids Mega Sampler 2010 was also disappointing. It kicks off with an eight-page chunk of a Billy Batson/Shazam tale that isn't new-reader-friendly. That's followed by eight pages of Tiny Titans material. Now I find that title delightful, but, despite its style of writing and art, it's always struck me as being aimed more at avid DCU readers than kids. This segment wasn't any different. Then comes an eight-page Batman/Martian Manhunter story that fails to convey the atmosphere and quality of the Batman: The Brave and the Bold comic book. Two filler pages from Super Friends conclude this sad FCBD effort. 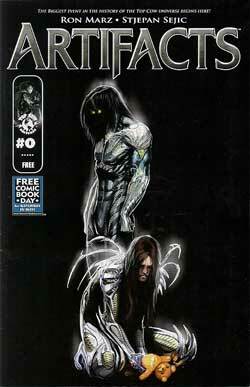 If DC repeats this in 2011, they need to put a lot more work into it. 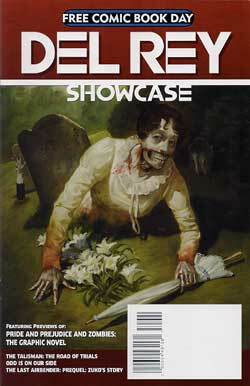 The Del Rey Showcase is a mixed bag. It begins with a terrific segment of Pride and Prejudice and Zombies; The Graphic Novel as adapted by Tony Lee and illustrated by Cliff Richards. As the only student in my high-school English literature class who enjoyed the works of Jane Austen, I found the segment captivating. It convince me to find and reread my Austen books, read the modern spins on them, and read this graphic novel. The segment from The Talisman wasn't as well done, but it does convey enough of the original novel and this adaptation to entice a new reader into following the series. Less impressive were the selections from Dean Koontz's Odd Is on Our Side and The Last Airbender prequel. I found the writing and the art uninteresting on both. Still, the Pride and Prejudice and Zombies pages more than made up for the failings of these two segments. 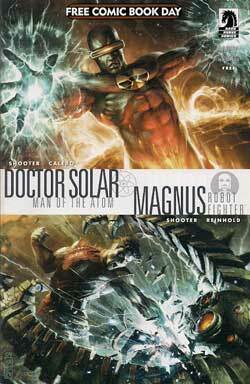 Free Comic Book Day: Doctor Solar, Man of the Atom/Magnus, Robot Fighter was the Dark Horse entry. Given the history of these characters, the regard for their past incarnations, and the interest in the Jim Shooter-written relaunches, this was a terrific choice for the publisher. I know I was eager to read the pair of stories featured in this issue. So I was keenly disappointed when I actually read them. It's not that either was a bad story - I thought the Solar tale had some fine moments in it - but neither was as good as the afore-mentioned earlier incarnations of the characters. In particular, the Magnus story was somewhat unfriendly to new readers. I'm not writing off either Solar or Magnus. I look forward to the debut issues of their new mags. But my continued interest will depend on the stories in those series being much better than these two short tales. Bluewater Comics produced a flip book for Free Comic Book Day: Fame/The Puppy Sister. Simply put, it is more certainly not a keeper. Even beyond the awkward pairing of comics biographies of popular singers and what appears to be a kids comics, this material falls far below what I would deem industry standards. The writing on the biographies is dull; it's somewhat better on the puppy tale. The art on these biographies is unappealing. The art on the puppy story boasts a couple good shots of the dog, but has little else to recommend it. Of the ten FCBD issues I've read so far, this one is the worst. 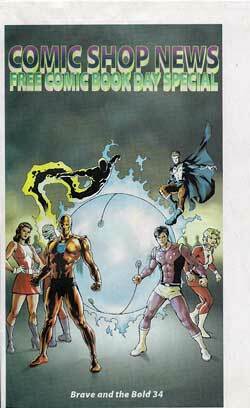 Unless Bluewater can come up with something much better for FCBD 2011, they should probably pass on participating in that event. They did themselves no favors here. Thanks for spending a part of your day with me. I'll be back tomorrow with more Free Comic Book Day reviews.